Originally constructed in 1964, the 10-million gallon Rancho Bernardo Reservoir, located next to the Soccer Field in High Country West, is an in-ground drinking water storage reservoir that provides a reliable water supply to the Rancho Bernardo community. Water is brought into the RB Reservoir from Miramar Lake, and is fed by gravity back into several areas in the northern reaches of the City of San Diego. 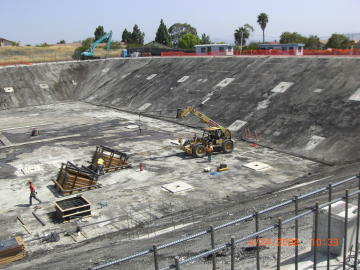 This project, which has been planned for many years, includes seismic retrofitting, installation of a new liner on the reservoir floor, and replacement of the original roof structure. Other mechanical and corrosion control measures are also part of the project. The new Black Mountain Reservoir enabled this reservoir to be taken off-line, so the rehabilitation project could be carried out without interrupting water suplies to the community. 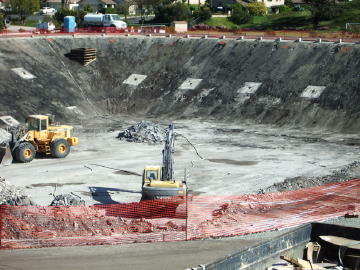 Construction began in March, 2008 and the old concrete cover has already been demolished. The entire project is expected to be completed before the end of this year. The High Country West soccer field on Lofty Trail Drive will continue to operate during the construction period. The Rancho Bernardo Reservoir is located in High Country West. This aerial photograph, taken in August, 2004, shows the reservoir next to the High Country West Soccer Field near the center of the photo. Cloudcrest Drive runs along the lower left, Big Springs Way goes up the right hand side, I-15 is seen at the top left (southbound going left to right), and Lofty Trail Drive runs parallel to the freeway just above the reservoir. 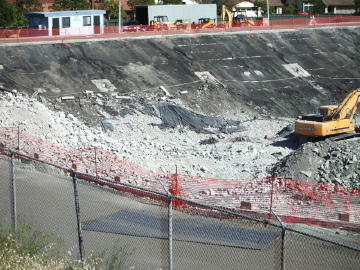 The next three photographs, taken in April, 2008, show the reservoir just after the cement roof was demolished. The debris from the roof is being broken up to be hauled away. These closeups give an idea of the depth of the reservoir. 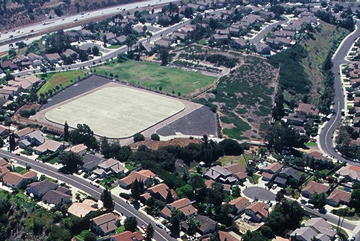 Because the Rancho Bernardo Reservoir is largely underground, many residents who have enjoyed using the Soccer Field were unaware they were playing next to a 10 million gallon reservoir. 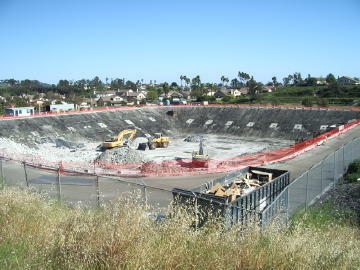 Here is the progress on May 2, 2008. 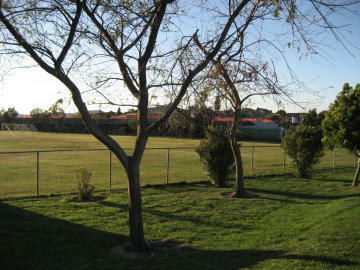 The High Country West Soccer Field, owned by the San Diego Water Department, is leased to the RB Recreation Council for a nominal fee. This important infrastructure project which will extend the service life of the Rancho Bernardo Reservoir. It will bring the reservoir into building code compliance and increase local water reliablility. 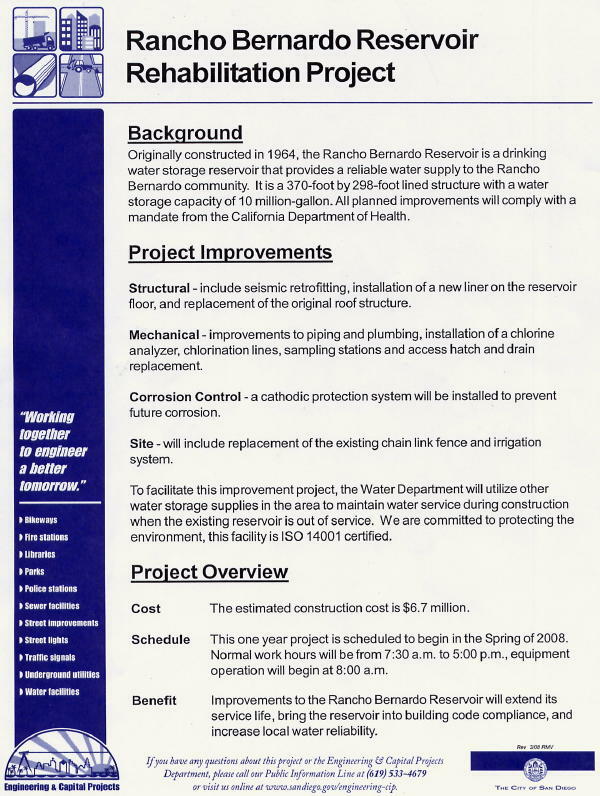 More information about the Rancho Bernardo Reservoir Rehabilitation, Infrastructure and Capital Improvements Program, is available on the City of San Diego website at www.sandiego.gov/water/cip/rbres.shtml. For information about the reservoir and the community of High Country West, or for other information about Rancho Bernardo, including housing opportunities, please call me, George Cooke at (858) 674-1222. Or send an email to George@GeorgeCooke.com.